These machines distinguish themselves by numerous uses and an excellent blasting effect in different areas of application. Traditional uses are: Desanding, deburring, surface treatment of crankcases, cylinder heads and other vehicle parts made of light metal (sand and die casting). 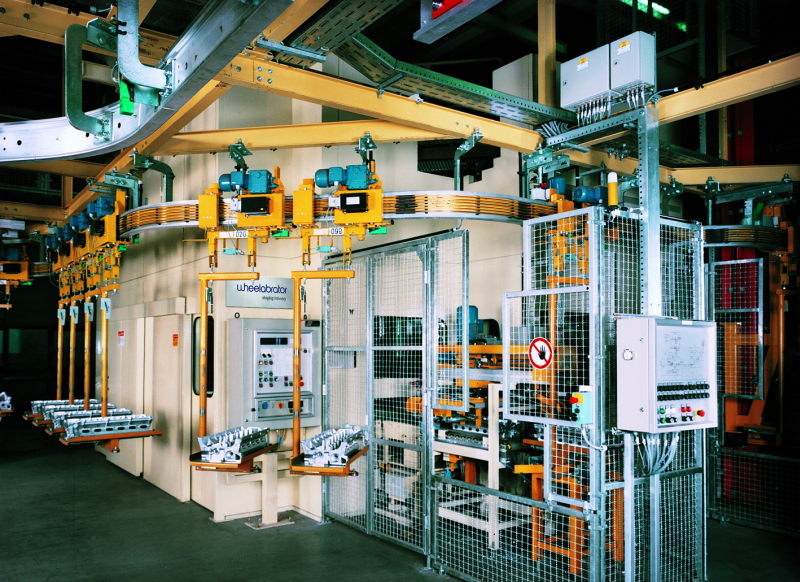 This machine concept provides for different basic versions with modules. This way, performance and space requirements can be considered to the maximum amount. In combination with pressure blasting machines, these machines can be integrated in automatic cleaning lines. Manipulators with one or two axed grippers take up workpieces and guide them through the machine (Fig. 1, Wheelabrator). 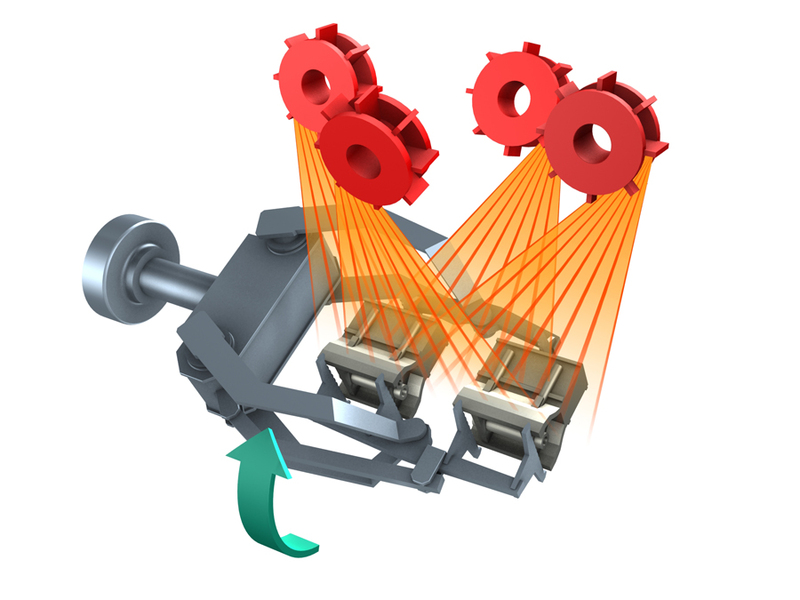 The grippers automatically adapt to the workpiece forms so that single or separate parts can be taken up (Fig.2, Wheelabrator) . 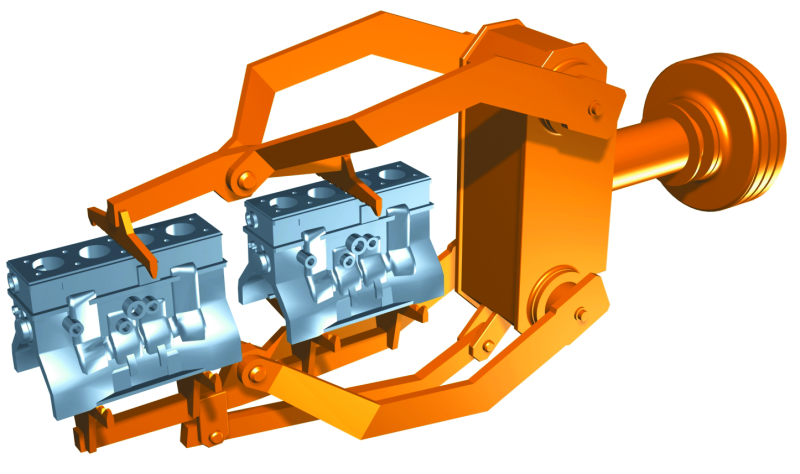 The feeding device or an industrial robot put non-basted parts into the manipulator and clamp them. 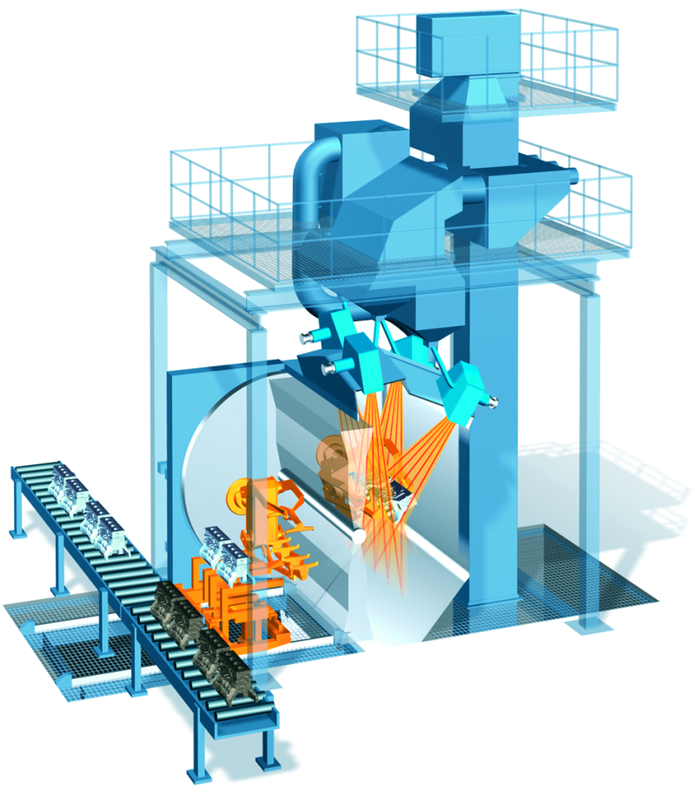 Automatic machines dispose of a workpice recognition system through which blasting parameters (blasting time, motions in the blasting fan, number of added centrifugal wheels, emptying time) are controled. Some blasting machines have two manipulators. The manipulator pliers size and loading capacity can be adapted to the abrasive. Thanks to the compact construction, it is very easy to integrate such blasting machines into existing machines. These machines always habe a manipulator in the blasting chamber while the second is being fed or emptied (Fig. 3, Wheelabrator). The entire blasting is only one process. Blasting material which remains in the casting is emptied in the machine. Manipulator blasting machines distinguish themselves by numerous uses and a good blasting effect: Even interior parts where access is rather difficult are cleaned without a blasting material build up. One example is illustrated in Fig. 4 (Wheelabrator). The robot blasting concept was implemented in numerous variants. Fig. 5 shows a machine concept to debur and refine the aliminum die casting part surfaces. 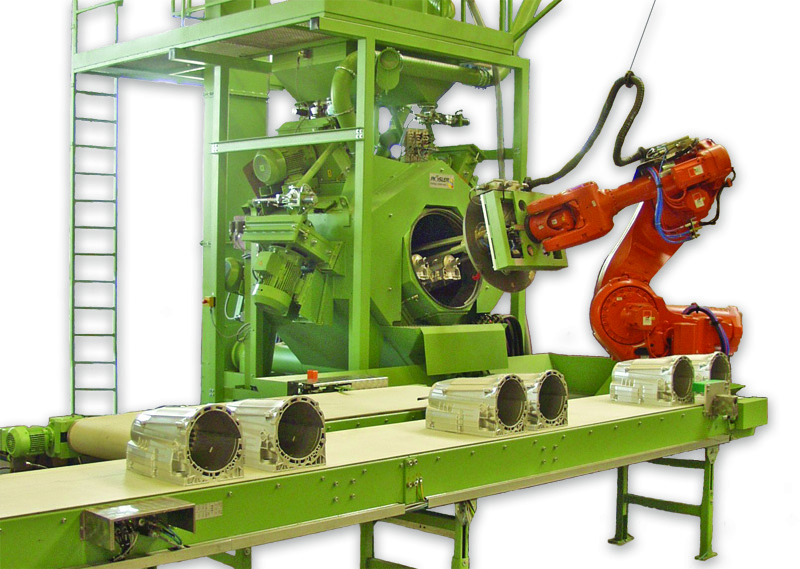 The patented sealing system is an exceptional specialty of this robot blasting machine. The robot seals the blasting machine opening by sitting on it with its docking plate. Since there are not mechanical locking systems, a reduction of cycle times, repair and wear sensitivity can be guaranteed.